ChamberPAC, the political arm of the Pennsylvania Chamber of Business and Industry, announced their endorsement of the Corbett-Crawley campaign. 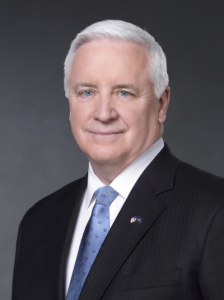 The committee is the state’s largest broad-based business association, and enthusiastically supported the “pro-jobs administration” of Governor Corbett. Though officially bipartisan, ChamberPAC more frequently endorses Republican candidates. “This dynamic gubernatorial ticket has kept the promises that they made four years ago as candidates to put the tax-and-spend policies of the past behind and reestablish Pennsylvania as a world economic leader,” Gene Barr, the President of the PA Chamber, stated. Overall classroom funding during the Corbett administration has actually decreased, due to a decrease in federal funding and the direction of education dollars toward pension obligations. Marcellus shale, drilling regulations, tort reform, unemployment benefits and taxation were among the reasons ChamberPAC provided in support of the governor. Lt. Governor Cawley warned that a Democratic victory in 2014 would bring DC politics back to the state. The endorsement shows that GOP interest groups are sticking with Corbett, despite the Governor’s lackluster polling numbers. The Chamber follows the Pa. Business Council, whose PEGPAC endorsed Corbett in November. Dear Noble Basile: It is time for Rep. Jimmy Christiani to follow his destiny and become a convicted Republican who will stand up to the UPMC intimidation of Leslie Gromis Baker and Scotty Baker. I believe in the transformation of the Human Spirit and this will lead Mr. Christiani to endorse Bob Guzzardi, the true Edmund Burke of Pennsylvania. PAINDY1 the only way to get Jim to do anything is through campaign contributions…..
State Representative Jim Christiana (R-Beaver) received more political contributions last year than all of the other five state reps for Beaver County combined, an investigation by the Beaver Countian has revealed. Over $3,000 was spent by Christiana’s Campaign last year on cigars, bought from places like Tinderbox International located in Harrisburg, which specializes in selling “the world’s finest cigars.” Finance Reports also show Christiana spent thousands paying for meals during “meetings” at places including the Hershey Country Club, Laurel Valley Golf Club, Rivercrest Golf Club, the Club at Shadow Lakes, Heinz Field, PNC Park, the Capital Grille in Pittsburgh, and the swanky Cioppino Restaurant and Cigar Bar. Those meal expenses don’t include the thousands spent as part of fundraisers held by the candidate. Tax and spend? What else would you call the transportation bill? jjcnpa….Coward Tom Corporate also cut education and other programs so much that school boards and other locals had to do the dirty work for him. Corbett raised gas taxes by 28 cents and increased vehicle registration fees. To say Corbett didn’t raise taxes is a lie. And fees are taxes. Roads needed to be funded and Corbett raised taxes and fees to pay for the increased funding but he broke his campaign promise not to raise taxes. He needs to be held accountable. I am shocked by Gene Barr and his board. Do they really want to turn over the economic policy making in the KEYSTONE State to non-elected Acting Governor John Brabender, a Virginia HORSE COUNTRY resident? Is Gene Barr getting Beltway fever? Is the US CHAMBER in Gene Barr’s future or can our Dark Prince John Brabender get him MSNBC as a regular contributor? Obviously the Pennsylvania Chamber is rightly terrified by the challenge from PA’s Edmund Burke, Bob Guzzardi. I just wish Mr. Barr, that we had real elected Pennsylvanians making decisions in our Governor’s office, not unelected avaricious Virginia Consultants. Gene Barr: is Dark Prince John Brabender a Pennsylvania Chamber Sponsor? His firm has been drinking the MOTHER’s Milk of the Pennsylvania business community for far too many decades. Wow: Gromis-Baker, Dark Prince John Brabender and the Tom Corbett juggernaut have to take out the heavy Guns to Thwart GOP challenger Bob Guzzardi. Mr. Guzzardi does the Republican Establishment expect you to crawl back to your cave in the Middle Kingdom? Rep. Jimmy Christiani: Be the first to break ranks and endorse the Edmund Burke of PA, Bob Guzzardi. Stick it to COS Gromis-Baker and Scotty Baker because they are sticking it to you. I remember working for Patrick Murphy in 2008 when Tom Manion rolled out an endorsement — as if it were going to happen any other way — of “Farmers for Manion” or some other such constituent group. That’s what so many of these things are. Lehigh Valley Building Trades endorses Pawlowski. Johnstown Building Trades endorses Critz. Backyard endorsements do nothing. Dog bites man.